On the beach of Vorupoer at the danish west coast the boats and ships of the local fishermen are pulled up the sandy beach for the night. There are only very few places like this one left where the boats on the beach provide a nice foreground for the spectacular sunsets on the north sea. 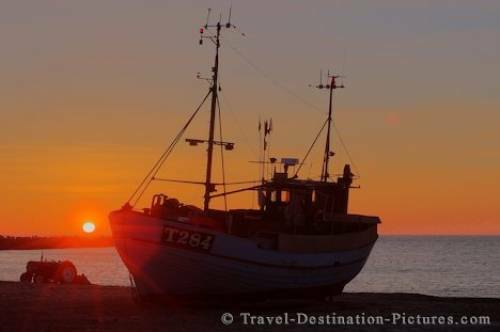 Fishing Boat at sunset along the North Sea beach in Vorupoer, Jutland, Denmark, Europe. Picture of a fishing boat during sunset over the North Sea and beach in the town of Vorupoer, Jutland, Denmark.